The history of foundation of the mother campus of Indian Veterinary Research Institute at Mukteswar can be traced from the recommendations of Col. J.H.B. Hallen, who was appointed as the Chairman of the Indian Cattle Plague Commission to focus attention on livestock conservation since the animal diseases were rampant and breeding operations were generally unsuccessful. This commission recommended the establishment of Veterinary Research Laboratory in India in 1885 with a view to undertake a geographical survey of the major contagions with which field workers in this country have to contend and to discover prophylactic measures for the various diseases disclosed by the survey. The foundation stone of research laboratory was laid by the Governor of Bombay on 9th December, 1889 at Pune on 5.5 acres of land adjoining the College of Science. The original Imperial Bacteriological Laboratory was housed in the College of Science at Pune and Dr. Alfred Lingard, a distinguished medical bacteriologist was appointed in 1891 as Imperial Bacteriologist. In the beginning, the laboratory devoted its attention to the preparation and distribution of Pasteur's anthrax vaccine. Later, when it was realized that the magnitude of the cattle disease,anthrax, in India, was only next to rinderpest, the Govt. of British India took upon the task of investigation, research and manufacture of a serum for the protection of bovines against rinderpest. For this purpose, the densely populated city of Pune was regarded as unsuitable. In August, 1893 it was decided to shift the laboratory to the Himalayas. Mukteswar was selected as the new site and about 3,000 acres of estate was purchased in the Kumaon hills. The salubrious climate, unpolluted natural environment and cold climate of Mukteswar was found to be congenial for the preservation of vaccines and sera and suitable for work on infectious microorganisms. In addition to large reserve forest area surrounding the experimental locations, it was sufficiently remote from populous areas for any fear of disease spreading from its experimental herds to the neighbouring cattle herds. In addition, hill cattle of Kumaon and Garhwal, a breed known till today for its high susceptibility to rinderpest were available in abundance. 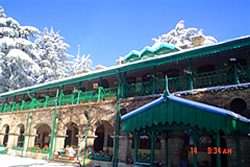 Mukteswar is situated at a height of 7,620 feet on the peak at junction of Gagar and Lohaghat ranges of the Kumaon hills, an area of exquisite natural scenic beauty, with its thick pine and oak forests, fast running springs and rivulets, rich fauna and flora, simple and hospitable people with rich cultural heritage. Overlooking the Institute Campus and adoring the highest point is the historic temple of Lord Shiva known as "Mahadeo" and from which the name of Mukteswar is derived for this place. The towering peaks of Nanda Devi (25,645 ft.), Trisul (23,360 ft.) and Panchuli (22,650 ft.) ever standing so high and kissing the sky with their thick cloak of perpetual snow, feeding the rivers emanating from this region, add to the grand panorama. In 1925, the name of the Imperial Bacteriological Laboratory was changed as Imperial Institute of Veterinary Research and the name of the Imperial Bacteriologist as the Director. Dr. J.D.E. Holmes expanded the dimension of research paving the way for the commercial manufacture of sera, to be carried out in the sub-station on the plains with the advantage of cheaper costs and more readily available transport to the field. Accordingly, a sub-station was established at Izatnagar in 1913 for large scale manufacture of sera and vaccines, and also for undertaking investigations which could best be conducted in the plains. With the passage of time and resultant expansion of activities, the daughter (Izatnagar) outgrew the mother (Mukteswsar) in 1931. Dr. Ware divided the work at Mukteswar into three sections, viz, Pathology, Serology and Protozoology, each headed by a Veterinary Research Officer. In 1936, the Imperial Veterinary Serum Institute, Izatnagar, became the Biological Products Section and the Institute was renamed as Imperial Veterinary Research Institute. Dr. Frank Ware planned the addition of new Sections at Izatnagar, namely, Animal Nutrition (1936), Poultry Research (1938) and Animal Genetics (1945). Soon after independence, the Institute was redesignated as the Indian Veterinary Research Institute. Mukteshwar spread over 3450 acres of land, now houses the Division of Virology and the Division of Temperate Animal Husbandry. The Virology Division conducts basic, adaptive and applied research on viral diseases of animals. The Central Typing Laboratory under development as International Centre of FMD virus typing also functions at this Campus. However, the Coordinating Unit of All-India Co-ordinated Research Project for Epidemiological Studies on FMD, is located at the main campus of IVRI, Izatnagar. The Division of Temperate Animal Husbandry conducts research on livestock production under temperate conditions and improvement of goats for pashmina production. There is a proposal to develop National Veterinary Museum at Mukteshwar.